One of my all-time favourite strips…Go for the Gusto! What’s been happening in your universe? Hi Celia, lovely times and I love your iPad stand. Your boys sure are smart – lucky you. Love the iPad stand! I was in the city and missed the clouds, bummer. The cartoon clip sounds like my son! School, school, school…when can I play? Love your Technic iPad holder! What a brilliant way to use Lego! The kites look so nice and colorful. What a lovely tradition at the chinese funeral. Penny, thank you! I DO have clever boys, and the envelope at the funeral was very touching.. I still love to kite & so does my husband! I see you are approaching Spring as we approach Autumn (Fall) with a few early mists and some leaves falling from the silver birch and horse chestnuts. I love your iPad holder! Lego is such a clever construction tool. My kids liked it and their kids like it as well. Not many things can say that! As for your kite, you must have felt a little lump in your throat when you heard that your old one had been exhibited! Love your eclectic, life-affirming mix of snippets! Gorgeous flowering pic too. The nights are just starting to draw in here as your Spring starts. What a great collection of snippets. I love the envelope at the funeral…a lovely tradition. The iPad stand is amazing. I think the IPad stand is brilliant too! What beautiful moments in life Celia, even the sad ones round it out and complete the circle. The iPad stand should enter some type of a design contest… very very COOL! Wow that iPad stand is fantastic! Love that it’s even adjustable. What a lovely tradition to hold on to. Beautiful little peek into your weeks Celia. My goodness, so much to comment on in your post. That first photo is absolutely gorgeous! I’ve never seen anything like it and I’m going to have to check out if they would grow in our climate. And, those are the strangest clouds I’ve ever seen. The kites are works of art as is your amazing IPad holder. Your husband and boys are so very creative and I love how it’s adjustable (as I sit here typing on my IPad in this cover/holder that keeps flopping over on me). I’m sorry for your friend’s loss but that is such a beautiful tradition. Being a very typical Gemini I do love going from one subject to the other: so loved your post. Two items especially: was incredibly touched by the Chinese Funeral envelope – how deep the philosophical thoughts engendered. 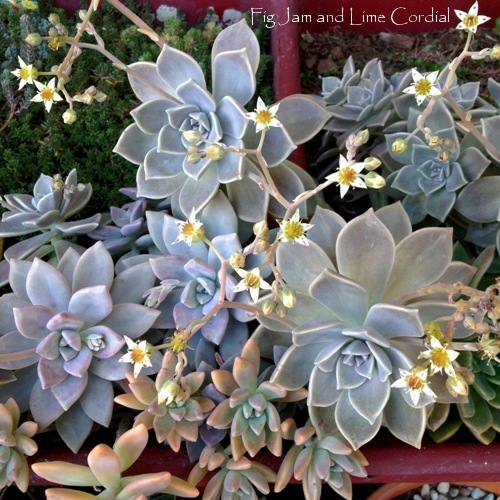 And thank you for telling me the names of my succulents also madly blooming in the garden . . . as are the japonica camellias, irises and my huge star jasmine :) ! Have to look into mine, don’t I ;) ! As always, thanks for sharing Celia. Loved this post. Charlie, it was so touching – I’ve never been to one where they’ve done that either. I much prefer the Chinese traditional of giving something rather than asking for something using the envelope! Such a lovely touch at the funeral. What is written on the envelope please Celia? Out of everything and like everybody else I just LOVE your iPad stand Celia. I love that Chinese funeral tradition. I thought was going to be a request for a donation – so much better. Your iPad stand is very clever! I love watching kites flying in the air. So free and exhilarating. Those are real beauties! Misky, we were really into the big kites for many years – our largest is a giant serpent kite which was (from memory) about 15 metres in length! How clever are your boys! Their fabulous invention definitely beats anything that you could buy! I think the Chinese funeral envelopes are so touching. What a beautiful tradition! Lisa, I’ve never seen clouds quite like the ones the other day. It must have been very windy up high! The moment I saw the photo of the iPad stand my thought was: “Those boys are engineers.” Love that it is adjustable also. Enjoyed your snippets, thanks for sharing. The last thing my youngest did before he left for his sophomore year of university was to hole up in his room with the giant bin-o-legos and create an awesome desk size collage. Now I know what I’m going to ask him to do when he comes home for Christmas! Thanks Celia!